ETC Pask Permeameter Kit | Engineering Technologies Canada Ltd. 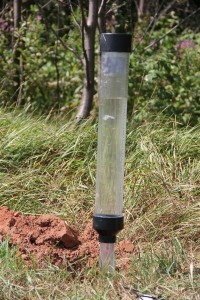 The field saturated hydraulic conductivity (Kfs) or permeability of natural soil and built up beds of fill can be quickly and easily measured in place using the ETC Pask Constant Head Permeameter Kit manufactured by Dynamic Monitors, a business unit of Engineering Technologies Canada Ltd. (ETC). 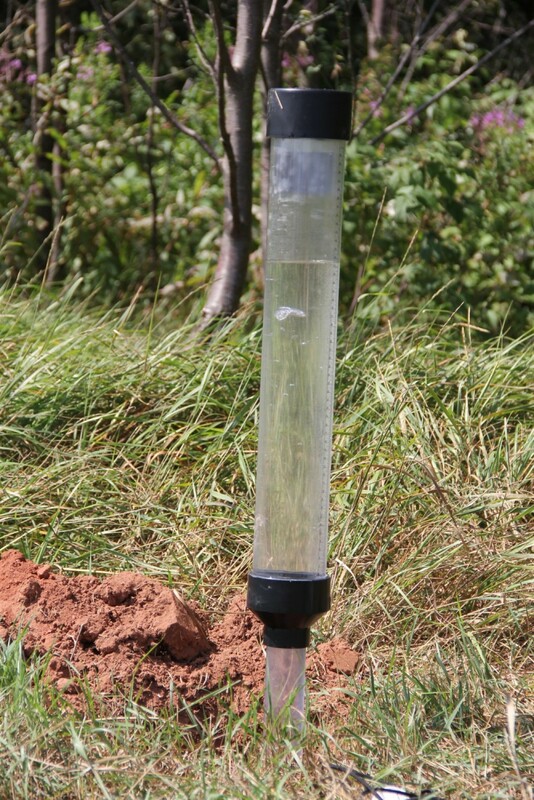 The concept for the Pask Permeameter was originally developed by David Pask, formerly of the Nova Scotia Dept. of Environment, and is a convenient and much less expensive alternative to the Guelph Permeameter®. The test procedure is based on the constant head well permeameter method (CHWP) described by Reynolds (2008) and by Elrick and Reynolds (1986). ETC has prepared an updated, user-friendly guide which incorporates the research by Reynolds, Elrick and others. An abbreviated version of ETC’s User Guide has been incorporated into the new CSA B65-12 Installation Code for Decentralized Wastewater Systems and also the New Brunswick Department of Health’s Technical Guidelines for On-site Sewage Disposal Systems. Our permeameter kit works with almost any soil type from loams and sands to clays, even built-up beds of imported septic fill or compacted clay liners for lagoons and landfills. It can also be used for the design of stormwater management systems. Our permeameter was recommended by Kimley-Horn for the assessment of large infiltration water quality BMPs to assess the BMP condition. Much more accurate and repeatable method of assessing the soil’s drainage properties than the percolation test. Unlike others, we use clear lightweight, and durable polycarbonate for the upper reservoir, rather than heavier SCH40 pipe. This makes our permeameter extremely light, minimizing the potential for it to sink into the soil and cause errors. NEW! 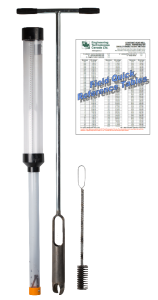 Our permeameter features a custom designed ABS cap with a secure, stainless steel clip. No more concerns about losing rubber stoppers in the bottom of the well holes! Very fast – a test on most soils can usually be completed in only 15 to 45 minutes. Small amount of water needed, typically 0.5 usgal (2 Liters) per test. Very visual; easy for homeowners to see how it works, and whether they have “good” soil or not. 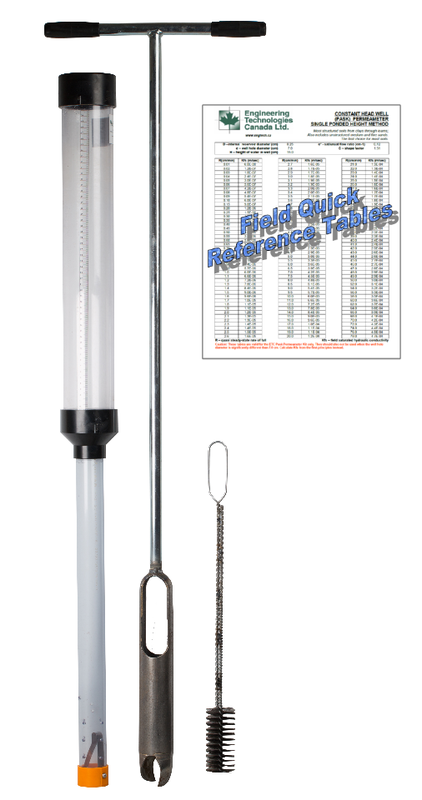 High quality, durable soil auger (manufactured by industry leader Eijkelkamp) hel ps to ensure the well hole is of the proper shape with a flat bottom. Calculations are made easy using ETC’s Quick Reference Tables. Constant head of water created by the ETC permeameter helps to minimize the impact of errors caused by improper soil characterization (estimation of α*). Visit the Dynamic Monitor’s on-line store to pur chase. Or contact us over the phone or through email for volume pricing on kits or individual components. Leave a comment below if you have any questions, or contact us 1-888-747-7645 (SOIL). Hello, my name is Jean-Louis Bastien, I work at the Cégep de Joliette in civil engineering. One of my students told me about the ETC Pask Permeameter Kit. We would like to try this permeameter in our laboratory . I wanted to know if it was possible to help you research this device also. Bonjour, je m’appelle Jean-Louis, je travaille au cégep de joliette en génie civil. L’un de mes étudiants m’a parlé du Perméamètre Pask. Nous aimerions essayer ce perméamètre dans l’un de nos laboratoires. Je voulais savoir si c’étais possible de vous aider dans la recherche sur cette appareil également. I want a Pask Constant Head Permeameter Kit. It’s possible to delivery to Québec for the next week? I see on your site the order form. I just need to complete the form and you ship a kit?